I very much want to see the Coen Brothers remake of this classic film, but I also wanted to see the original John Wayne flick before checking out the new one. I’m not a particularly huge John Wayne fan. 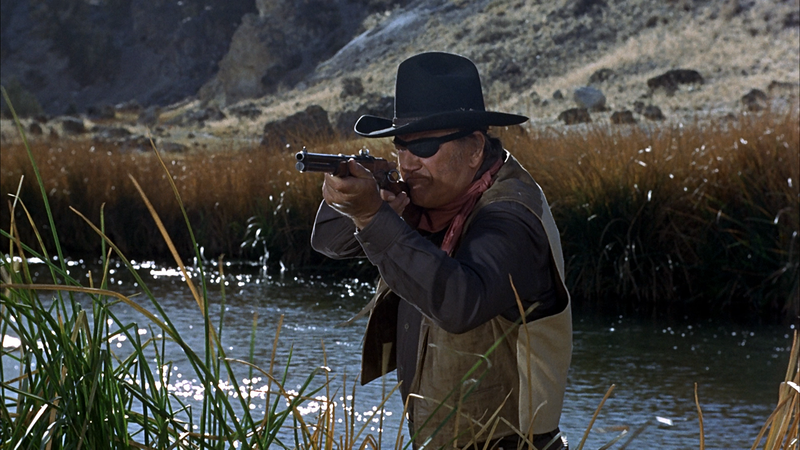 I haven’t seen too much of his, but absolutely hated THE SEARCHERS (though I liked STAGECOACH very much). But his portrayal of Rooster Cogburn is one of his most iconic roles in a career full of them, so this is a movie I’ve long wanted to see. The Western is probably the one genre I am most hit-or-miss with. I find them to be very formulaic, and the era about which they are made often allows for a sort of passive racism (which is the main reason I hated THE SEARCHERS so much). But TRUE GRIT does a great job of blazing its own trail. Three mismatched strangers hunt down a killer (and anyone else worth a reward), to surprisingly interesting results. Wayne partners here with singer Glen Campbell and a very young Kim Darby. The chemistry among the three is wonderful to watch develop, and I love the way that their personalities remain unchanged through the climax, but that they come to an understanding anyway. A film is often only as good as its villains, and Robert Duvall plays a very human one. This is also an unexpected turn. The way these guys hunt each other while holding each other in such regard is a device utilized often in film, and it works in a very non-cliched way here. I wish that Duvall played into the climax more, as the snake bite at the end rings a little hollow after the very gritty way the rest of the conclusion played out. The dialogue is sharp. The characters well written, and the story (aside from the snake) effective. I was impressed all around, and am glad I finally caught up with this classic. ~ by johnlink00 on December 28, 2010.